At the law office of Ozurovich & Schwartz in Torrance, California, we devote our practice exclusively to workers' compensation and Social Security Disability claims in order to help our clients secure the finances they need to cover their medical bills, lost wages and other expenses. 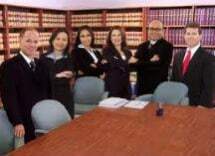 Serving injured and disabled workers throughout Los Angeles County and the surrounding areas of Southern California since 1980, our law firm has become an invaluable source of quality, effective counsel and representation to thousands of individuals and families, and we are proud to be able to affect positive changes in the lives of so many. Since all we focus on is workers' compensation and SSDI, we can offer a level of advocacy and support unmatched by other legal practices in the region, and we promise to work closely with you throughout all legal proceedings, from our initial consultation all the way through to the completion of your case, to ensure we have done all we can to help you recover the money you need to support yourself and your family now that you can no longer work. Whether your injury is the result of a sudden accident, or you developed a debilitating condition over time due to repeated motions, you can rely on our team of dedicated attorneys to help you obtain the maximum amount of benefits you deserve. For more information, you can contact the law office of Ozurovich & Schwartz to receive a free initial consultation concerning your matter, and we will never require a fee from you unless we obtain finances on your behalf.